If you are not using a cache system, you can skip this section. Hans from Germany visits the store and looks at a product. Hans sees the German price. The cache system saves the page in the cache. Charles from the UK visits the store and looks at the same product. As the page is cached, he sees German prices, rather than UK prices. Enable the option Load products price in background (recommended). Or, set the WooCommerce option Default Customer Address to Geolocate with page caching support. 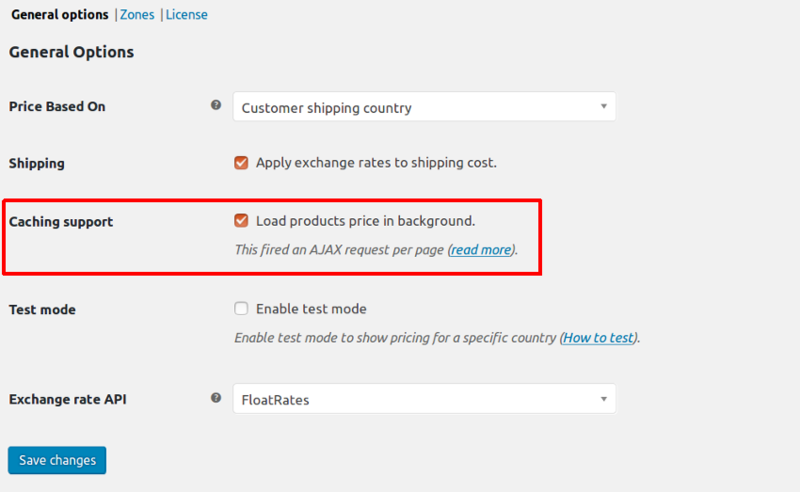 If you enable this option, Price Based on Country fires an AJAX request on each page to refresh prices dynamically. To enable it go to WooCommerce → Settings → Zone Pricing → General options and select Load products price in background. You must manually clear the cache of your cache plugin and your hosting provider after enabled Load products price in background. Load products price in background supports default WooCommerce product types (Simple, Virtual, Downloadable, External, Grouped and Variable). Pro version adds support to WooCommerce Subscriptions, WooCommerce Product Bundles, WooCommerce Product Add-ons and WooCommerce Bookings. Currently, this option does not support WooCommerce Composite Products, if you are using this type of product you have to enable WooCommerce Geolocate with page caching support. You must manually clear the cache of your cache plugin and your hosting provider after set Geolocate with page caching support.